In this chapter, students will read about the characteristics and major phyla of the protists. For convenience, this survey of the kingdom Protista divides the phyla into three descriptive, nontaxonomic groupsthe animallike, plantlike, and funguslike protists. The links below lead to additional resources to help you with this chapter. These include Hot Links to Web sites related to the topics in this chapter, the Take It to the Net activities referred to in your textbook, a Self-Test you can use to test your knowledge of this chapter, and Teaching Links that instructors may find useful for their students. 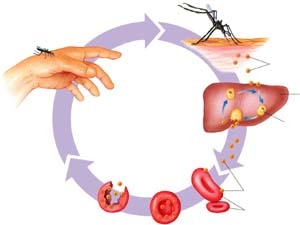 We've revised the Malaria Life Cycle (Figure 20-7 on page 501 of the Dragonfly Book) to make it more informative. Click Here for a copy of the new figure. The Caption for Figure 20-21 (page 517) mis-identifies this slime mold in some editions of the Dragonfly Book. It's actually an acellular slime mold. Click Here or on the photo (above) for details.